office space in a way that will boost your mood, productivity, and client relationships? For inspiration, here are a few tips to keep in mind as you consider the ambiance and environment in which you conduct business. 1. A little goes a long way Redecorating your office space doesn’t have to break the bank. Style and décor are often about tiny details adding up to make an overall impression. For instance, paint color, plant life, and lighting are all straightforward ways to rejuvenate a room without spending a fortune. Have dark, drab walls? Consider springing for a lighter, fresher color that will breathe new life into your space. Have bare window sills or empty corners? Buying and potting a few low-maintenance plants like ferns or succulents can add freshness and pops of color to a sparse room. Rely on fluorescent lighting? Consider sprucing up your space with a few well-chosen floor and table lamps that add accents of taste while warming up the tone in your office. A few intuitively placed items can inspire renewed energy. 3. Think like a client Imagine you’re walking into the office for the first time. As a client, what details would stick out? What red flags would come to mind? While you’re used to working in the same space every day, clients are coming into your office with no set expectations. With that in mind, complete a walkthrough of your office area to address eye sores, clutter, and whatever feels unprofessional or amateur. Half the battle of redecorating your space is finding opportunities and seeing things anew, instead of being content with the status quo. 4. Build out your brand Redecorating your space is about aesthetics, but it’s also about creating a unifying setting for your professional brand. If you’re catering to luxury clientele, it makes sense that your office space should appear elegant, high-end, and sophisticated. If you’re selling second homes out in the country, perhaps a more rugged but well-curated ambiance would set the right tone for your services. Maybe you’re courting the Millennial market or touting your tech-forward approach to real estate. In that case, a modern, sleek, progressive layout would speak to your company’s values and culture. Whatever the case may be, think of your office environment as an extension of your brand that communicates with clients, motivates your team, and sets the tone for your day-to-day operations. Even if decorating isn’t exactly in your wheelhouse, there are plenty of simple and philosophical shifts you can make to your space that will maximize your presence and productivity. What’s more, real estate is a business built on relationships—so it doesn’t hurt to create an office where clients are comfortable and confident in the environment you’ve built. architecture retains its value. Do your homework on architects and find the ones that have a good track record of designing beautiful, but practical homes. Don’t simply pay attention to how the building looks today. Consider how it will look in a few decades. Keep an eye out for the “bones” of the building, and decide whether they will stand the test of time or not. Things such as a solid foundation, high-grade materials, unusual details, and artistic components are good aspects to consider. Will the structure hold up well or will it degrade and crumble without constant upkeep? That funky molding may look artistic today, but in ten years will it be considered artistic or just plain weird? in comfort. As a buyer of luxury property, you probably have quite a busy social schedule. You want to make sure that the layout will lend itself to helping you maintain clear separation between your social areas and private ones. You don’t want guests having to go back into your bedroom to use the bathroom. Look out for places with stairwells, awkward columns, long hallways, and other wastes of space. a home that gives you lots of natural light, such as one that is open to the outdoors. That natural light will improve your mood, as well as the resale value. The openness of a space filled with natural light will make you feel more comfortable and happy in your new home. What about the view? Do you see a Do	you	park, a bridge, a river, or a skyline? Is the see	a	park,	fantastic view out your window protected? a	bridge,	You’ll need to understand the surrounding air a	river,	or	a	rights and zoning allowances of neighboring buildings to understand the possible risks. skyline? cooling. Make sure they are double-paned with good insulation that will protect your home against weather and noise. Unless the windows are already like this, it is unlikely that the condo or co-op board will allow you to install your own. •	Ceiling	Height: Consider the cubic footage of the property. You want to look for high ceilings that increase the openness of a room. Of course, you don’t want to go too high. Above 14 feet will get you diminished marginal returns. any luxury home or apartment. Do you really want to have to trek down flights of stairs to use the basement laundry? If you still consider it wasted space, you can convert it into more closet space. frustrating fixer-uppers no matter how much you want to add custom kitchens, finishes, fixtures, and other characteristics. Choose a property that already has all of these amenities taken care of. These properties have already had the same designers you would hire fashion the house at a fraction of the cost you would pay to have them do it after you move in. In this light, it is worthwhile to pay a little extra for the move-in ready home. property that has a good reputation tends to retain its value. You can easily find this out online on posts, and established locals are likely to have an opinion. 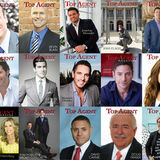 Robb Cohen’s clients feel like they’re on top of the world when they’re working with him. able service he and his team provide. “Every client leaves 100 percent knowledgeable of all options available for their specific needs and beyond satisfied with our service,” says Robb, proudly. “We make the entire process absolutely transparent and seamless for them. We do not sell them homes – We assist and educate our clients in the process of buying homes” Robb believes in giving back both to the real estate community and his community in general. ests. Instead of throwing one giant party, host a pool party for the families with kids or a wine and cheese get together for single clients. Hosting special events like these ones goes a long way towards keeping your contact with past clients more personalized and setting you apart from those businesses that simply send them a calendar once a year. 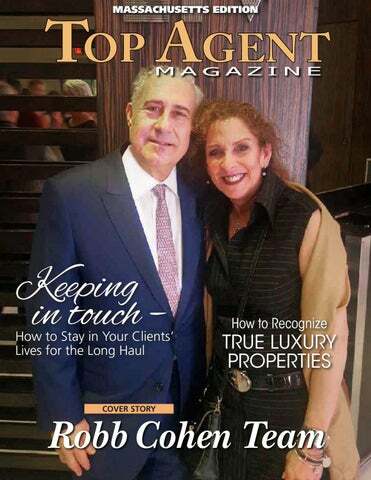 PROVIDE CLIENTS WITH USEFUL NEWS PROVIDE CLIENTS WITH USEFUL NEWS One way that many REALTORSÂŽ keep in touch with their clients is by sending them newsletters. This form of contact can be a double-edged sword. You want to make sure you provide them with useful information that reminds them of your value as a real estate professional. Otherwise your communication will amount to nothing more than spam, and clients will think of you less as a trusted friend and more as a nuisance salesperson. Clients react much more positively to communication containing information that is pertinent to their lives. Update your clients on what is going on in their local community and housing market. Demonstrate your knowledge about the community and the things that are important to your clients. Include information about local cultural events, community news, housing statistics, information on the mortgage market, home maintenance advice, home design tips, and anything else that your clients will find personally useful. Your clients will always be interested in value. SEND CLIENTS MEMORABLE AND PERSONAL CARDS Sending your clients cards related to important events in their lives and letting them know that you remember those events and care will go a long way towards building and maintaining a close personal relationship with them. You want to make sure your cards stand out, though. Sending popular holiday cards can be a mistake, as they will most likely get lost amongst all of your clients other holiday cards and will be quickly forgotten. Instead send something more personal such as: HOME ANNIVERSARY CARDS: Send cards to each client on the anniversary of the closing of their home. CONGRATULATORY CARDS: Remember important events such as wedding anniversaries, graduations, new babies, etc. GIVE CLIENTS AN UNUSUAL GIFT Make sure the gifts you send your past clients stand out. Send your past clients an odd gift at the beginning of the year or on a holiday. Think outside the box and send things like funny magnets, customized mugs, a personalized piece of wall décor, and other fun and unusual items. A great way to make your gift stand out even more is to include a funny note with it that will catch their attention as well as make them think of you. For example, one cute idea is to send clients a bag of popcorn with the note, “Real estate is popping, give me a call.” You could send a bag of goldfish with a note attached that says, “I’m fishing for your referrals.” Get creative and have a little fun with it, your clients will notice and remember you for it. You can even organize your contacts on Facebook into customized lists such as “past clients,” “industry contacts,” etc. This will help you better manage your Facebook contacts. This will also allow you to view specific news feeds based on these lists and send messages to a particular list of contacts. Don’t forget about the many other social networking sites such as Twitter or LinkedIn either. Utilize this technology to drive personal contact with your clients. So, you’re tired of clearing your papers off the dining room table every time someone wants to eat (how dare they!). And you’re still recovering from the business call you were forced to take that time your 5-yearold pressed the phone into your hand just as you stepped from the shower (it’s amazing how professional one can sound while wrapped in a towel and dripping wet). fairly easily for this purpose. Use bookcases, filing cabinets, plants, screens, even lighting to define your work space. It’s essential that you remain committed to your space as office space. Without this psychological distinction between home and work, the two areas of your life may slide into one another, causing you to lose focus, and thus, productivity.